Rob Espstein and Jeffrey Friedman's film Howl doesn't play out like your typical biopic, with a systematic chain of events through a person's life. 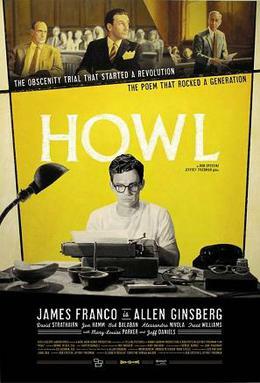 The film tells the tale of legendary beat poet Allen Ginsberg (James Franco) and the controversy surrounding his most famous work, Howl upon its original publication in 1956 - documenting the ridiculous trial that went with it a year later. The film seems to appear more as a satirical courtroom drama - testing the boundaries of free speech and copyright - which also includes a series of flashbacks to the man's life leading up to the moment. Similar to last year's excellent biopic about Serge Gainsbourg, it also has these trippy animated sequences which neither diminish the slick film-making in the live portions of the film, or, regrettably, enhance the enjoyment of the film. Just to disorientate the audience further the film skips between vivid colourful shots and crisp black and white. Personally it would've been far better had they stuck with the latter. All the technical criticisms aside though, James Franco was excellent - should we even be surprised anymore? - in the role of Ginsberg. Suave, curious, wide-eyed yet also slightly naive and vulnerable to the world around him. Due to the film being more about the poem rather than the man, it's a shame we don't get to explore his inner psyche further, unlike his Oscar nominated turn in January's uplifting, soul searching journey in 127 Hours. Similarly the amount of insanely talented supporting actors featured in Howl are at times either underused or their characters are underdeveloped - including Jeff Daniels and Mary Louise Parker. Jon Hamm once again channels his inner Don Draper in the role of slick, defence lawyer to the stars, Jake Ehrlich but unfortunately for the Mad Men actor he ever gets to stretch himself in the same ways audiences have seen him on the hit TV show he stars in. The same could also be said about the brilliant David Strathairn who plays opposite Hamm as the prosecution on the trial. The animated portions of the film tried to do so much on such a minimal budget, containing vast amounts of drug fuelled psychedelic sequences and explicit imagery, the ending result almost looked incomplete at times, which is a genuine shame. I did however love the 1950s Madison Avenue sequence near the beginning which was just glorious and as if lifted straight from the illustrated works of Dyna Moe - who any Mad Men fanboy/girls will undoubtedly be aware of. The best thing about Howl however is the message it's trying to communicate to its audience. This isn't about how many cool actors you could cram into one picture, nor is it about how hip you can make the production of your film look - combining colour, black and white and bizarre animated sequences all into one. Howl documents the birth of a counter-culture which has had a vast influence on the wider pop culture in the decades since, it's about freedom of speech, leaving your inhibitions at the door and experiencing life to the fullest. And only then can documenting its trial and its hugely significant result be put into context and why a film should be made about it. It also makes you appreciate the more reflective, sombre tones of Carter Burwell's exquisite score - though it could have used a little more jazz. The brilliant performances of James Franco, Jon Hamm and David Strathairn are overshadowed by a visually messy presentation from directors, Rob Espstein and Jeffrey Friedman. However, as a friend of mine rightly said upon leaving the cinema, "If you're going to watch a messy film, you'll find few which will be as visually stunning as that". Like all great works of poetry, it's always a matter of perspective, and perhaps over time Howl might age as gracefully as the written work which inspired it. Howl is showing in selected cinemas throughout the UK now. Belfast audiences can see it in the Queen's Film Theatre now.